Vinesh Phogat has stated that the Indian wrestling team has four to five strong contenders who can at least win two to three medals for the country at the Olympic Games. 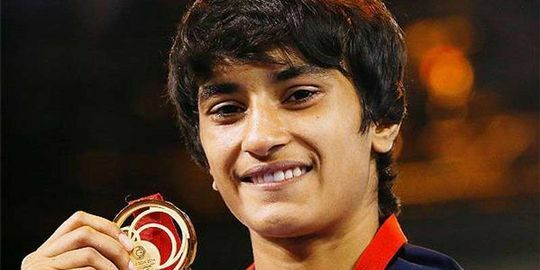 Phogat has been recently nominated for the Laureus World Sports Awards for making a strong comeback to wrestling after injury. Indian wrestlers Sushil Kumar and Divya Kakran have decided to pull out of the World Wrestling Championship to be held this year. Struggling with form Sushil has decided to stay away from the prestigious event while Kakran is suffering from an ankle injury after the Asian Games in Indonesia. Indian woman wrestler, Vinesh Phogat has won the second gold medal for India on the second day of the Asian games 2018 at Jakarta. Vinesh played the 50 kg weight category freestyle wrestling final against Japan's Yuki Irie and registered her win to clinch the second gold medal for India. Veteran Indian wrestler Sushil Kumar has asserted that his career is far from being over despite a disappointing first-round exit from the Asian Games putting a question mark on his future. Sushil added that the defeat was unexpected but accepted that such things happen in sports.